The Dow Jones Industrial Average is my favorite of all of the stock market indexes. You know how many charts we look at every week at our shop. So with the plethora of price data that comes across my desk, it’s really the simplicity of the 30 stocks that represent the Dow that makes me appreciate the index for what it is. The Dow is a price weighted index where the highest priced stocks represent a larger portion of the index. For this reason, it often gets dismissed in favor of the “broader-based”, market cap-weighted S&P500. Some like myself even prefer the Russell3000 index which is really representative of the US Stock market. Funny enough, as different as these indexes may be on paper, that’s why they play the game. Here are what the 3 of these things look like in real life. Let’s just say that if you get the Dow right, you’re likely to be on the right side of the other ones too. So, if this is the case, would you rather analyze 500 or even 3000 stocks? Or is 30 a better, more reasonable number? 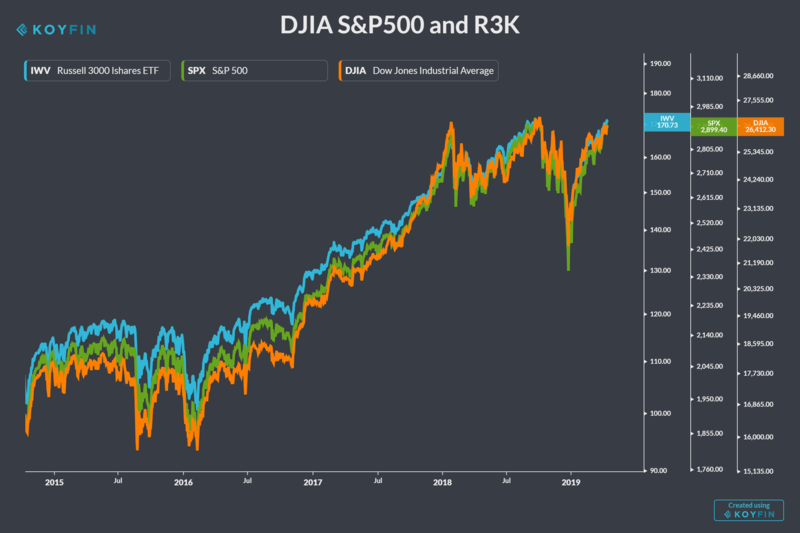 I encourage you to check out “Why The Dow Jones Industrial Average is Underrated” and “Everything You Need To Know About Dow Theory”. Today I wanted to share a workbook of the Dow 30 stocks with very simple annotations. What we’re really trying to do here is count how many are in uptrends, how many in downtrends and how many in sideways trends. If there are more bad ones than good ones, it’s hard for the stock market to do well. The opposite is also true. If more of these are going up, it’s hard for the indexes to fall. This helps us decide which we would rather be doing, selling stocks or buying them. This is a quick and simple exercise. We’re not analyzing momentum. We don’t have a rainbow of moving averages. We’re just trying to identify trends. By my count, I’d say about half of these are in sideways ranges and about 10 of them are already making all-time highs, including names like Microsoft, Cisco, Walt Disney, McDonald’s, Nike and Visa. It’s hard to find too many downtrends on this list. Putting everything else you (think you) know aside, is this an environment where we want to be buying stocks or selling them? Check them out and tell me what you think? I really like this exercise. It’s a good way to clear out the noise and just focus on what is actually taking place in what, I like to argue, is the most valuable index in America.